Birding Taiwan: New hill, old haunt. This morning I explored a new place, Jhungliao Mountain (large hill by Taiwan standards) Kaohsiung County. Will certainly be back. Freeway #3 passes under it, near where Kaohsiung becomes Pingtung. There is a section of ‘Moonworld’ on the north side, and a distinctive long bridge on the south side where crossing the Gaoping River. On top there is a small village, small fields (little farming allowed to prevent erosion), and many communication-related transmitters. The best way up it is via road #40 (need to confirm that!) that starts on #21 just south of Qishan Town. Be aware if continuing on down into Yenchao - there are many small roads to ensure you get lost. Bring a GPS (SatNav) gadget. Afterwards, a visit to the small but nice Pheasant-tailed Jacana Reserve. Many thanks to a stranger for pointing out the latest sandpiper...I really struggle to get excited about IDing them. 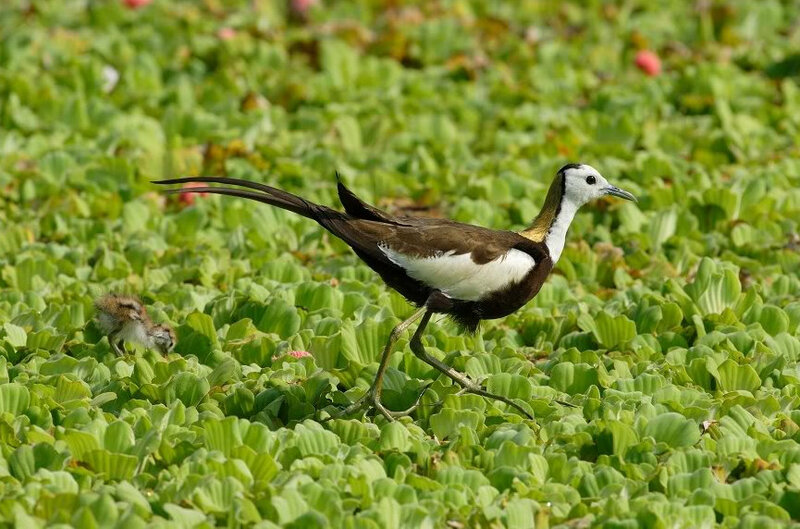 Bird of the day the Jacanas (below, in summer plumage) - not any sandpiper. Lots of locations north of Tainan City, not just the main reserve, have easy to find Black-faced Spoonbills. Over 1500 reported in the general area. The best way to get to the Pheasant-tailed Jacana Reserve (at Hulipu/Guantien) by car is: from Freeways #1 or #3 turn onto Expressway 84 (the section between #1 and #3), exit at Xizhuang, turn right (East) on #171, after about 1 kilometer take the road to the left (signposted in English), the reserve will on your right-hand side after about 1 km. Closed every Monday, and for the last few days of every month from the 25th. New birds seen at Jhongliao Mountain, Kaohsiung. Crested Goshawk Accipiter trivirgatus "Endemic subspecies (A. t. formosae)"
Barred Buttonquail Turnix suscitator "Endemic subspecies (T. s. rostratus)"
New Birds seen at Pheasant-tailed Jacana Reserve, Tainan. New birds seen at Sihcao, Tainan.